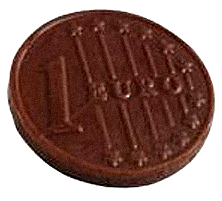 Chocolate coin, edited from another image somewhere on the wiki. This image contains pixels from various ambiguous sources which may or may not be copyrighted. In most cases, it will be covered by the Commons Attribution-Noncommercial-Share Alike 2.5 Generic License and Fair Dealing or Fair Use. This file may have been imported from various places. Specific details have been lost due to either neglect, laziness, or some other form of lack of effort subsequent to a cabal decision that "it was clearly all lies to begin with". If you know where this came from, please feel free to replace this notice. The copyright status of this file is unknown. Until its source and/or status can be determined, fair use of some sort will be assumed. Reusing this file elsewhere is not advised, though anyone who can shed some light on this is encouraged to replace this notice with an appropriate copyright template. This page was last edited on 5 Jeremy 2013, at 20:26.